Break chocolate into smaller pieces and melt in the microwave – about 3 minutes. Stir in cherries, almonds and marshmallow pieces. Line an 8 x 8 inch pan with foil and spread the mixture evenly in the pan. Allow to refrigerate for at least one hour. Slice fresh strawberries and set aside. When chocolate is hardened, break apart into jagged pieces. 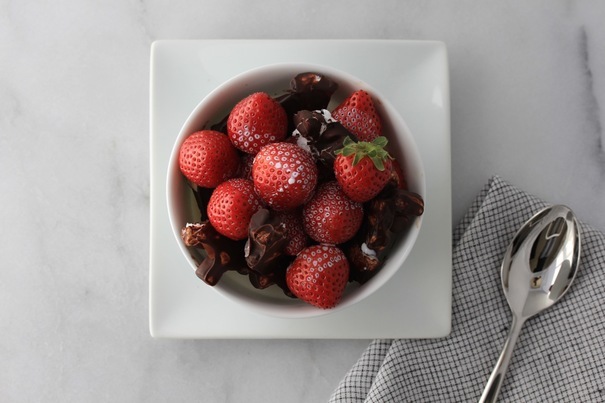 Line a small bowl with the rocky road, add strawberries and serve with a small pitcher of cream for pouring on it. 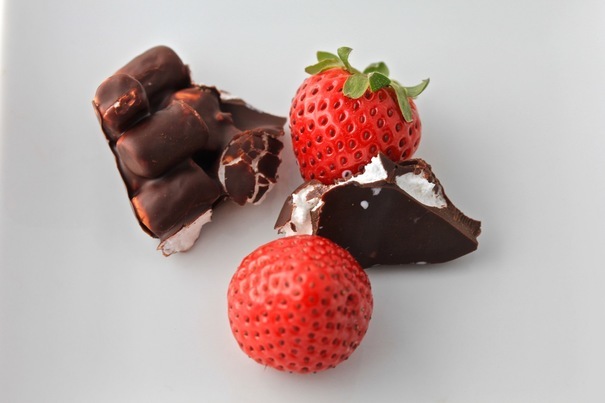 Alternatively, serve bowls of strawberries for dessert, and offer rocky road as a post-dessert sweet with coffee.